A beautiful photo--of the Queen Mary, not the Lincoln SS-100X. Even though the crime scene car was available. Something to do with the height differential between the rear and jump seats, and the height-to-pavement. More confirmation of Gil's evidence! 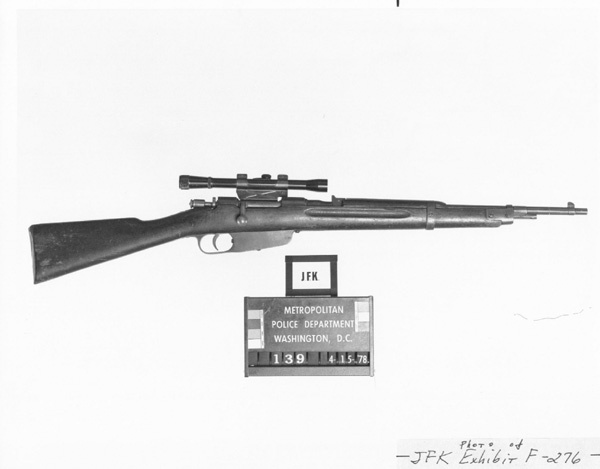 The enclosed image shows the Carcano in evidence turned around the opposite way from the side-mount side. You can CLEARLY see from this side that there are ABSOLUTELY no mounting fixtures visible on the bottom of the rifle. Compare this to the backyard photo and you can see the difference right away. I edited off the parts that said this was case cracking evidence due to standards of absolute proof. Last edited by Albert Doyle; 01-25-2011 at 11:33 PM. the speeches, historical videos, newsreels and the like. But the new channel will be devoted ENTIRELY to the assassination. new channel, they will remain intact on the old one. Wow! I came to this forum just a year and a half ago, and until tonight hadn't looked at the YouTube JFK assassination playlist Gil Jesus put together roughly four years ago in the second link above (JFK63Conspiracy). This is basic stuff, and everyone here probably knows at least some of it already, but it is POWERFUL! It may be the briefest and most compelling collection of evidence I've ever seen showing how thoroughly the FBI and the Warren Commission lied to America and the world about President Kennedy's assassination and the witnesses who saw it. If I'm the only one here just discovering this ... well ... sorry for the interruption and NEVER MIND.